ViscoStat is a 20% ferric sulfate hemostatic agent packaged in a 30 ml Indespense syringe along with 20 disposable 1.2 ml syringes and 20 Dento-Infusor application tips. The solution has a greater viscosity and a different taste than the 15% solution, Astringident. Viscostat was evaluated by 19 consultants in over 340 clinical uses. It received a 95% clinical rating. Consultants reported that Viscostat was readily incorporated into their office treatment regimes. The disposable syringes are easily filled from the bulk syringe. The delivery system rated highly. Evaluators reported control of the viscous solution on the teeth was excellent. The material may be applied accurately, and it stays in place. The solution and the technique of scrubbing the tissue with a Dento-Infusor tip were found to produce hemostasis rapidly even in situations of heavy bleeding, such as deep crevices and vital pulpectomy. Impression detail is not compromised. Negative patient response to taste was rarely reported. A majority of consultants stated that they would both purchase and recommend ViscoStat. Leave material on for a minimum of time and rapidly wash clotted debris away. Care is needed in use as a solution – will stain clothes and gloves. Rinse well to remove all of the solution as the set of some impression materials is delayed or prevented by some hemostatic agents. 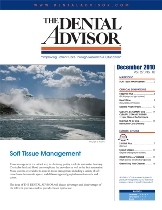 ViscoStat was originally published in THE DENTAL ADVISOR Plus, Vol. 6, No. 3, May/June 1996.